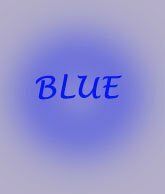 Here I'll try to explain Blue Auras colour meaning. The Aura colours that surround an individual can reflect their personality and point to their future destiny. Many have studied the Auras colour meaning and Psychics can detect the predominant Aura colours surrounding someone. Having a predominant blue Aura or energy field surrounding you can point to a number of personality traits. Totally blue Auras are quite rare but can show up as one of the boldest Aura colours in people with strong personalities. People with blue in their Aura are the master communicators of the world. They have the ability to convey their thoughts, ideas, views and concepts eloquently and charismatically. They make for excellent writers, poets and politicians. Having predominantly blue in an Aura means a person are also highly intelligent and very intuitive. They certainly have the head and heart balanced in making difficult decisions and choices. They are incredibly good organisers and can motivate and inspire others. Kindness and consideration come naturally to people with blue in their Auras. This is directed not just to people they love but to the wider world. People who have a predominant amount of blue in their Auras are peacemakers and have the ability to calmly smooth out angry situations. They prize truthfulness, direct communication and clarity in all their relationships. They can be very affectionate too and like to lavish their time and energy on their loved ones. People who have a lot of blue in their Aura tend to be very accepting of others with the ability to relate to many and varied people. They are just as relaxed and at home in the company of either paupers or princes. Harmony and peaceful interactions are very important to people with blue in their Auras. They pride themselves on their honesty and integrity and have the ability to see many different points of view. Because of these traits they find themselves well liked and respected. Many actors, musicians and politicians have a lot of blue in their Aura these include George Clooney, Bono and Richard Gere. The downside of the Blue Aura personality is that they can take on too much, become workaholics and neglect their personal relationships. They also dislike change and fear anything new and can be quite stubborn. This stubbornness coupled with the dislike of change can mean they become very set in their ways. In Aura Readings a gifted Psychic can not only identify your predominant Aura colour or colours but also any blemishes, patches or streaks of darker colours that may be holding you back and preventing you living the type of life you want for yourself. We all know of the phrases "seeing red", being "green with envy", "feeling blue" and having a "yellow streak". These undoubtedly have their basis in the colours of the Aura. Someone suffering from depression or low moods generally has a predominance of dark blue patches in their Auras. And angry, volatile and hot tempered people normally have large amounts of dark red in their Auras. Each Aura colour is related to the characteristics and personality traits of individuals. If you send me a recent head and shoulders picture I can detect if the colour pink is dominant in your Aura. I can also check if your Aura is tinged and tainted with deep and dark coloured streaks, blotches, shadows or patches. These unwanted blemishes in the Aura can come from traumatic events in past lives or emotional, physical or mental pressures in a present life. This manifests itself as dark, dull Aura colours. I can detect these negative blemishes within your Aura colours and use gentle but powerful Minoan Energy Healing to repair your Aura.